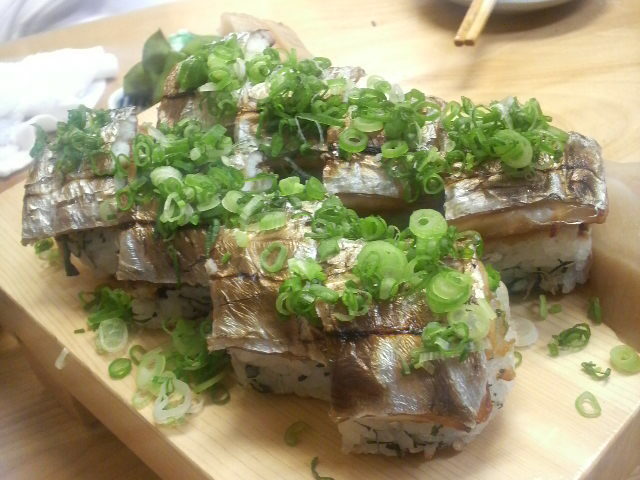 Scabbard Fish at Parche Supermarket in Shizuoka City! There seems to be an endless list of names for Tachiuo/太刀魚! In Japanese it means “big Sword Fish”! I’ve always liked the name of Scabbard Fish as it becomes an interesting comparison with the meaning of the Janaese name! This is the Wikipedia definition which does not things any clearer! The largehead hairtail (also beltfish), Trichiurus lepturus, is a member of the cutlassfish family, Trichiuridae. It is a long, slender fish found throughout the tropical and temperate waters of the world. The Atlantic and Pacific populations are also known as Atlantic cutlassfish and Pacific cutlassfish, respectively. Largehead hairtails can grow to over 2 m in length; the largest recorded weight is 5 kg and the oldest recorded age is 15 years. They live in shallow coastal waters, rising to eat planktonic crustaceans during the day and returning to the sea bed at night. These were caught in the Suruga Bay off Yui, Shimizu Ku, Shizuoka City! They seem a bit pricey at 1,500 yen a piece, but they are the freshest samples you will find anywhere except on boats! You will find cheaper ones in other markets but they will not be that fresh and will bear many injuries as the skin is very thin and easily broken! Do not buy fish with broken skin, a sure sign of lack of freshness! They certainly not easy to put on display for the reason of their length! 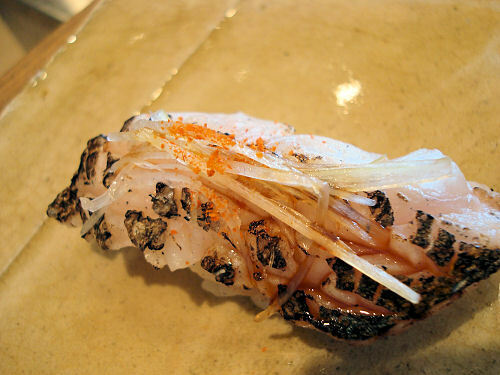 It is a very versatile fish which can be appreciated as sashimi, sushi both raw or aburi/seared! It is a little beauty as tempura, but you can also cook it grilled or in sauce in all kinds of gastronomy! 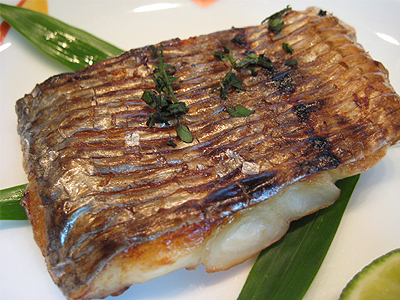 Scabbard Fish or “Tachiuo” is a summer fish very popular in Japan in spite of its great length. Tachiuo in Japanese, 太刀魚, means “Great Sword Fish”, not the scabbard! 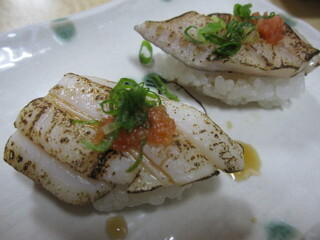 The Suruga Bay being warmer than the rest of Japan, we have scabbard fish in the dead of winter. Like other fish it owns other names: Tachi (not in Hokkaido, where the word means ” Cod sperm sacs”! ), Shirada and Tachinouo. 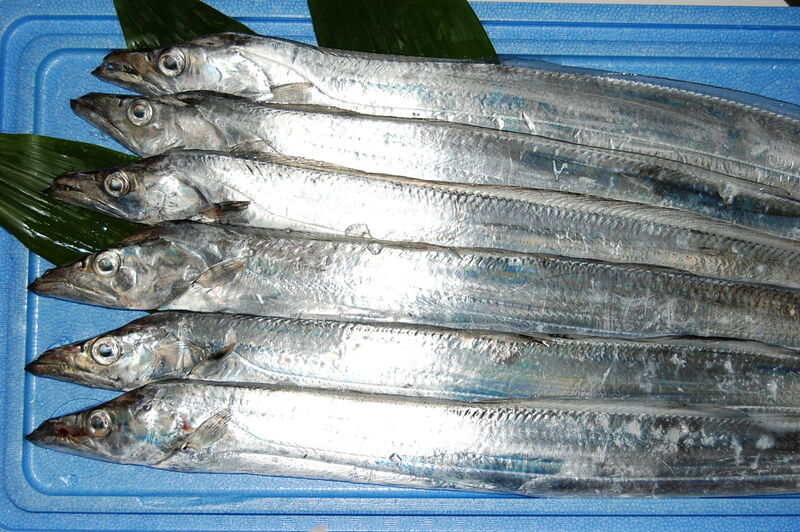 It is mainly caught off Wakayama, Ehime and Oita Prefectures. In Shizuoka it is both caught by line or net. In 1999, 37,000 tonnes were caught in the whole of Japan, but it fell to 23,000 tonnes in 2000. 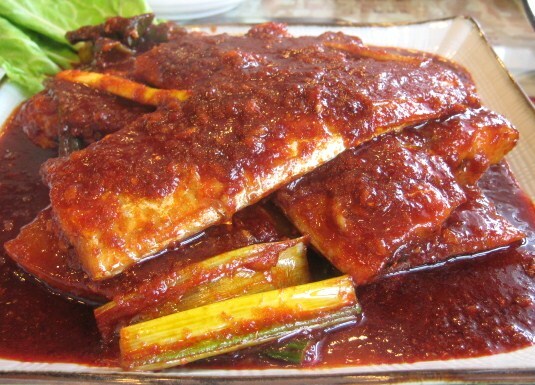 It is also imported from Korea and China, although the fish is slightly different from the Japanese variety. 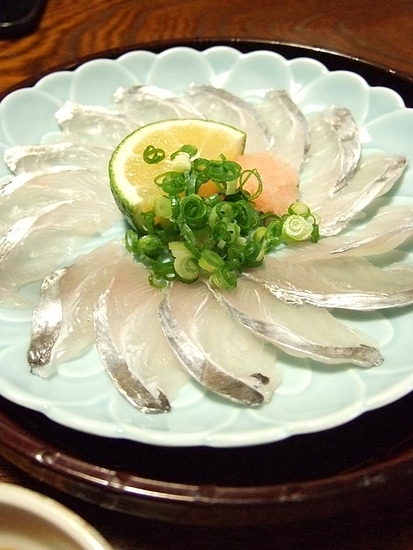 More than half of imported fish are eaten west of Kansai. 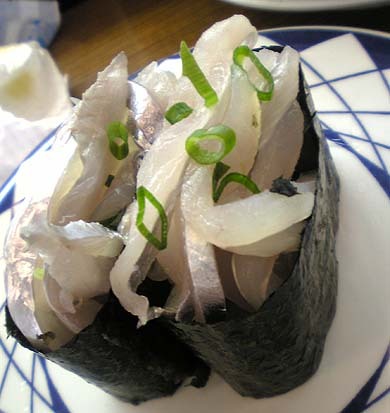 Tachiuo is bot popular raw and cooked. 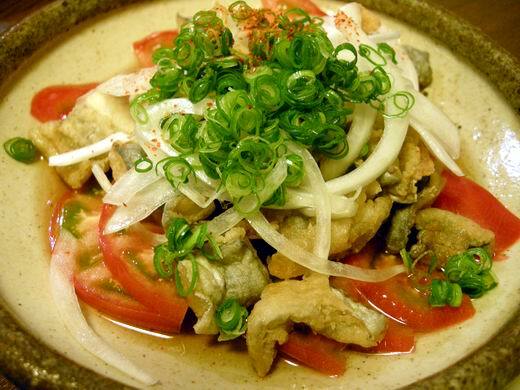 Raw, it is usually served with ponzu instead of soy suce and topped with momijioroshi/grated daikon mixed with chili pepper. cut into fine strips and served as gunkan. 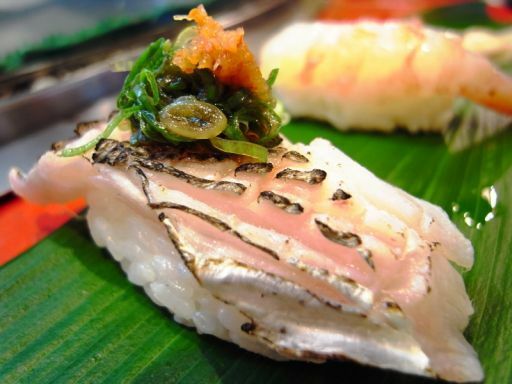 As sashimi I personally prefer it “aburi” (slightly grilled) with a dash of ponzu and some momijioroshi (grated daikon with chili pepper), or with some finely cut vegetables. 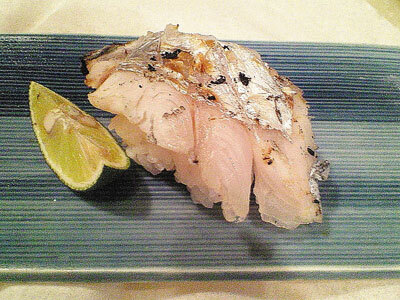 The same applies for sushi nigiri as I like my scabbard fish a little grilled first. Making incisions into the fish before grilling it will make for another prsentation! It does not have to be complicated to be yummy! 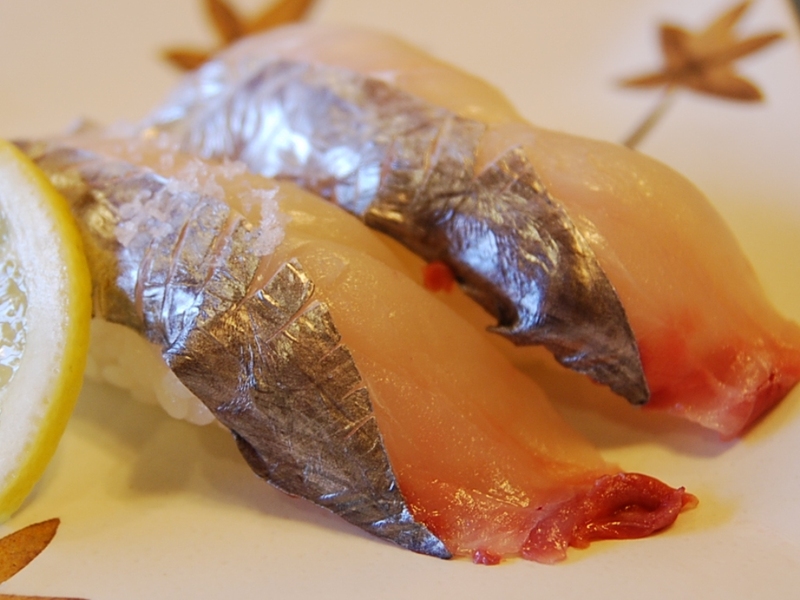 In the Kansai/western Japan region it is very popular in oshizushi/pressed sushi thanks to its flat and long shape. 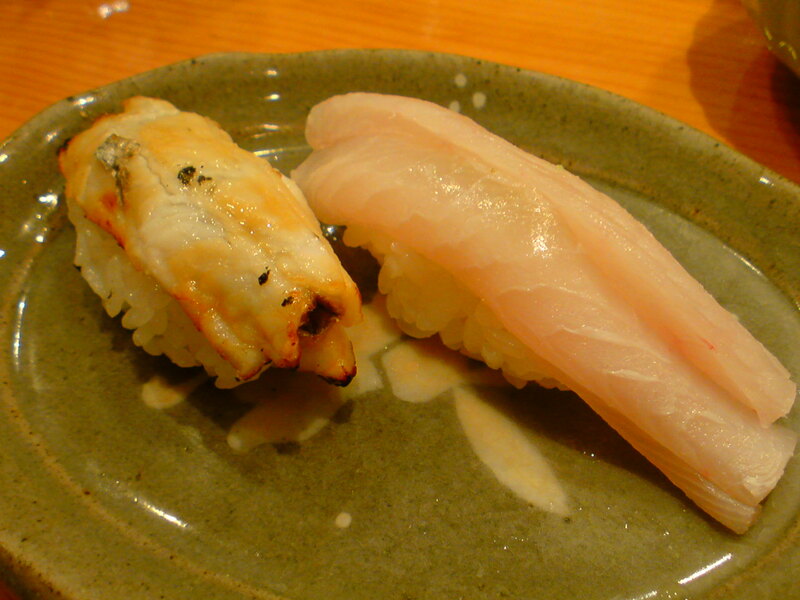 How about a combination of both raw and aburi style sushi nigiri? 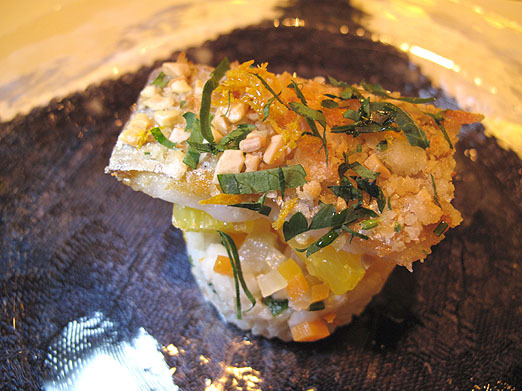 How about an Italian-style sushi nigiri? 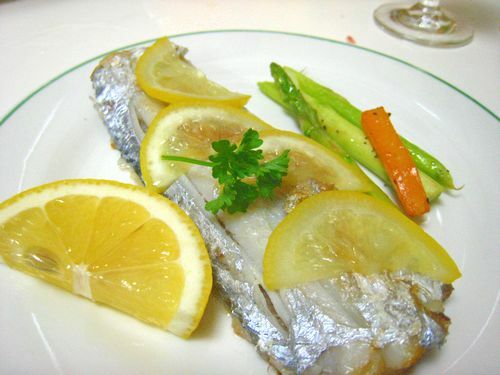 As for the cooked scabbard fish, grilling is the most commoon way here in Japan where it is served as simple and healthy food at many meals. Sauteed with colourful vegetables (okra) make for great presentation in spite of the simplicity of the dish! 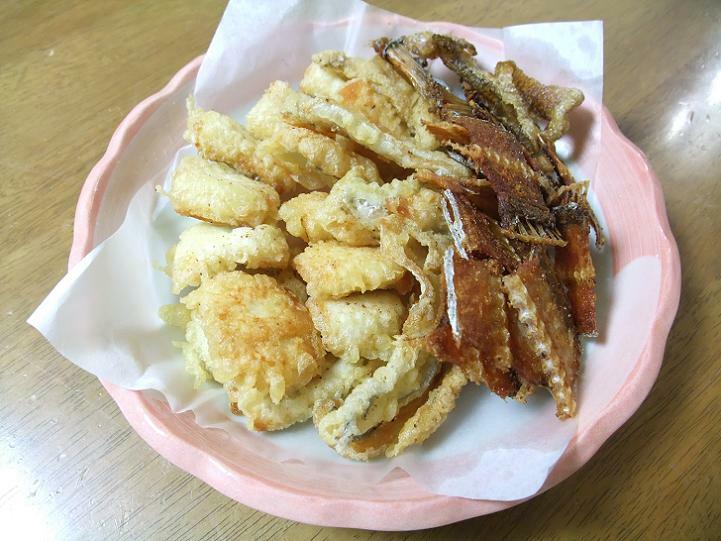 Deep-frying is also very popular especially with its bones when it is very fresh. Such deep-fried bones make for one vital source of calcium for the Japanese. 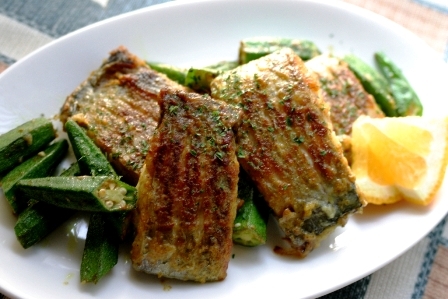 Cooked, it is a very versatile fish and easy to prepare! Cooked with chili peppers and miso paste, it makes for an intriguing sweet and hot combination!